We, at Greenworldinvestor, have been the constant proponents of solar energy and are of the opinion that solar technology is set to become one of the mainstay sources of power in the coming decade, as prices of lithium-ion batteries decline. One of the biggest examples of this fact is Germany. The country has been witnessing a fast adoption of solar power, driven by a drop in solar battery prices. Almost 120,000 households and small businesses have installed solar panels atop their establishments. Today, one out of every two rooftop solar orders is sold with a battery storage system in Germany. Though 120,000 is a small percentage in the overall 80+ million population, analysts foresee a green future with “a solar array on every roof, an electric vehicle in every garage, and a battery in every basement” in Germany. “Home storage can be expanded the same way we did solar power,” says Volker Quaschning, a professor of renewable energy systems at the University of Applied Sciences in Berlin. German companies like Enerix, Sonnen, and Solarwatt who were facing challenges with their solar operations, suddenly sprung up. Sonnen is Germany’s leading maker of home batteries. The country now has close to 44 manufacturers of home energy storage systems. About 1 million buildings have rooftop solar systems installed, but lack storage units. There is a growing demand for batteries from these customers. Other than the domestic market, Germany is also supplying to international markets like France, Great Britain, Italy, the Netherlands, Spain, Australia and South Korea. In Germany, for a house with 20 panels installed, the price of a home storage system will range in between $8000 to $11,000 each for the PV array and the battery and DC/AC power inverter. It makes complete economic sense to install solar in Germany with plenty of sunlight and falling prices. It can lead to savings of close to 80% on one’s electricity bills. In addition, it also increases the overall green footprint. As technology advances and efficiencies improve, the cost of energy storage systems should fall by another 50% to 70% globally by 2025 as predicted by the consulting firm McKinsey. It all started with Germany. Ten years ago, when solar technology was in a niche state, Germany kind of revolutionized the whole movement. Germany became the world’s largest solar market in 2010-2011. We hope that Germany becomes trendsetter again for mass solar storage adoption. Countries elsewhere in the world are also looking at increasing their green footprint. 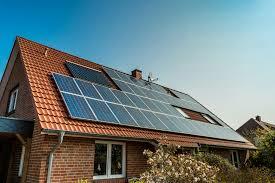 California demands that all newly constructed residential buildings must be fitted with solar panels by 2020.